According to Herbert Kroemer, Nobel Prize in physics for his work on semiconductor heterostructures and optoelectronics, in the early 1970s “do-it-yourself quantum mechanics was made possible by new research technologies, such as Molecular Beam Epitaxy (MBE)” . This was a decade which saw the emergence of the first 2D quantum wells developed by MBE, opening the way to quantum electronics. It’s a fact: nanotechnology, quantum physics and epitaxy are closely linked, in a technical, technological or historical point of view. Now, let us look in detail, at the place of epitaxy in thin film elaboration. Epitaxy is a word that describes the extended single crystal formation on top of a crystalline substrate. If such a crystalline structure is often of little importance for most thin film applications, it is crucial for semiconductor fabrication. 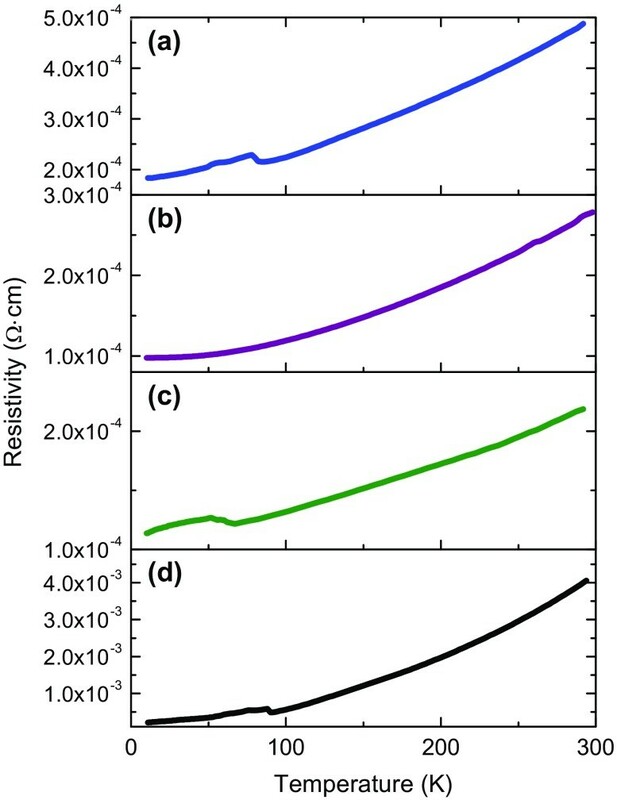 Two types of epitaxial growth can be distinguished : homoepitaxy and heteorepitaxy. An homoepitaxial growth leads to the formation of layers of a similar nature as the crystalline substrate. 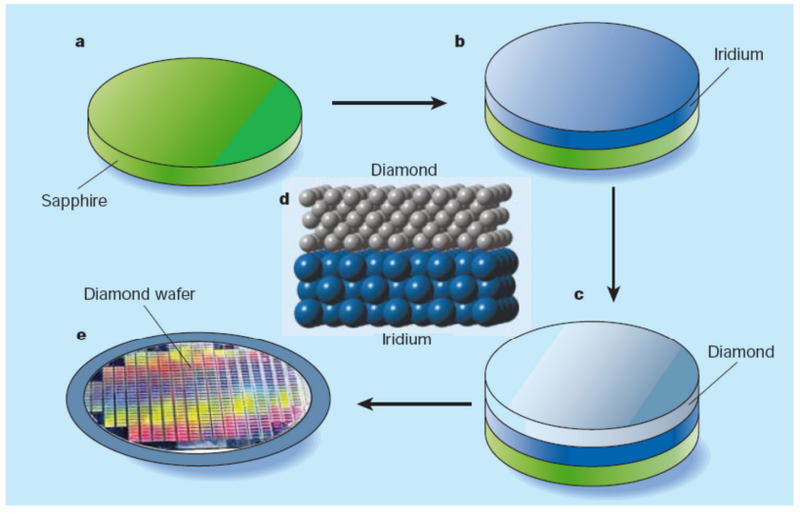 A classic example is Si growth on silicon wafers, but other materials can be used : diamond can be homoepitaxially grown by CVD on diamond wafers. In the case of diamond, heteroepitaxy is an interesting alternative because it allows growing diamond on another material, such as sapphire, which is less expensive than a single-crystal diamond substrate. Source : Nature 2003, 424, 500; Science 2008, 319, 1490. The possibility of combining different materials by heteroepitaxy allows the creation of optoelectronic structures and band gap engineered devices. However, this characteristic is associated with the build-up of elastic strain in the growing film. Strain is due to the difference between the lattice constants of the film and the substrate. Consequently, lattice constants must be close to avoid dislocations. There are two main methods for semiconductor hetero structure fabrication : Metal Organic Vapor Phase Epitaxy (MOVPE) and Molecular Beam Epitaxy (MBE). 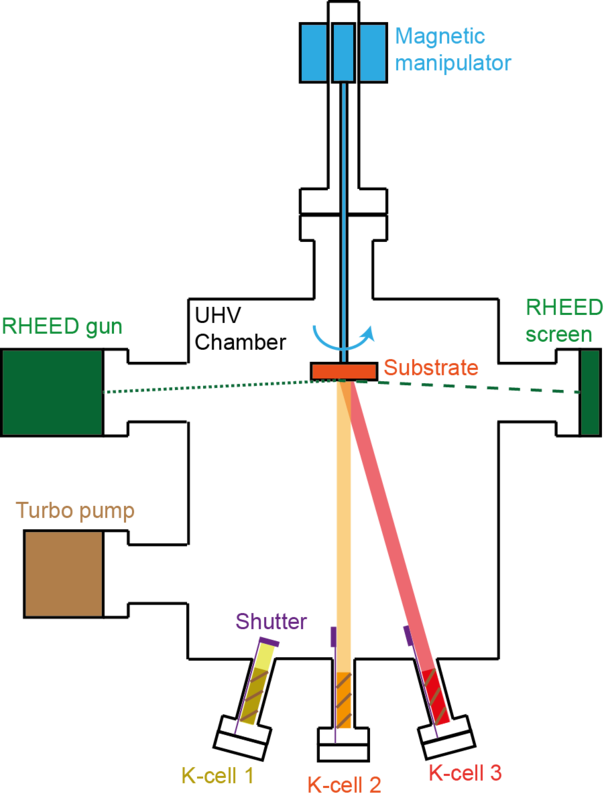 But there are other methods, often derived from CVD techniques, each method using its own reactor design, growth temperature and deposition speed. Molecular-beam epitaxy is a process developed in the 60s for thin-film deposition of single crystals. Today, it is a common way to manufacture semiconductor devices, such as transistors. 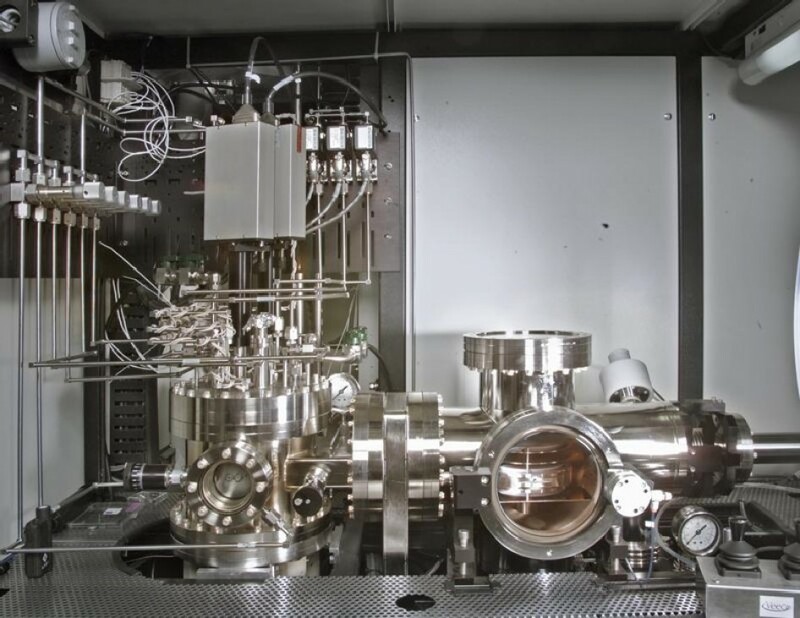 But the main feature of MBE is certainly its ability to make coatings reduced to a height of an atomic layer (approximately 0.3 nm). This exploit is linked to the ultra-high vacuum conditions of the chamber, which gives a high crystalline quality and very pure layers. 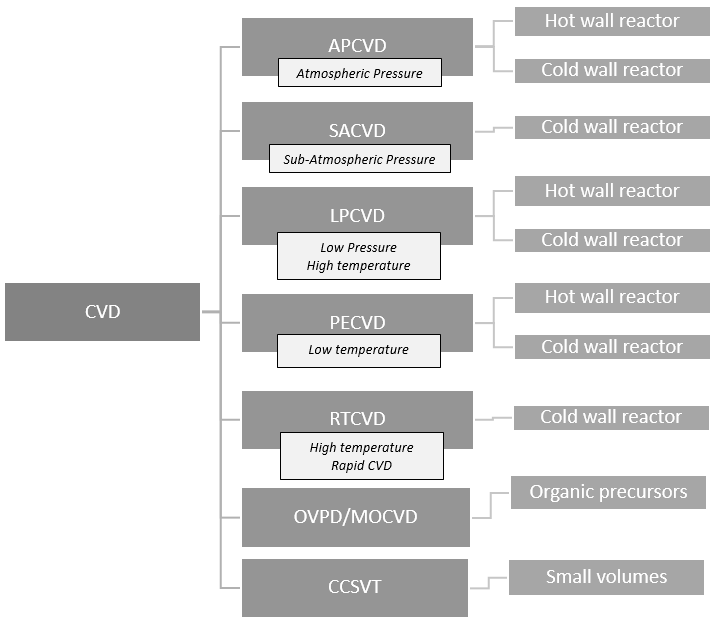 In a general point of view, the “CVD-process family” is quite large, because many parameters can be changed : especially pressure, temperature and the nature of the precursor. In the case of semiconductor deposition and epitaxy, several CVD-based techniques exist, and their name is often given in relation to the nature of the gas used. For III-V semiconductor deposition, three families can be distinguished. The case of PECVD is also interesting, because this is a low temperature technique. Then, a lot of materials can be used as precursors without degrading heat-sensitive substrates. This technique can also be processed at atmospheric pressure. LPE involves the precipitation of a crystalline film from a supersaturated melt, on a substrate. LPE is often used to grow multilayer semiconductors on monocrystalline semiconductor wafers, from a molten metallic solution. For example, a solution of liquid gallium can be used with a GaAs source wafer at 700°C to create a Ga-rich melt saturated with As and then grow an epitaxial GaAs film on a substrate. Phosphorene is a new 2D material made of few atomic layers (or a single) of black phosphorous. Phosphorene has better properties than graphene, and it’s suitable for a large variety of optical or electronic applications. Moreover, it has high carrier mobility and an intrinsic tunable direct band gap. The standard procedure to obtain phosphorene is by exfoliation, a technique that could be replaced by molecular beam epitaxy. Indeed, the Institut des Sciences Moléculaires d’Orsay (ISMO) has succeeded in growing such phosphorene monolayers by MBE on Au(111) substrates. The research team now wants to go further. In order to reach the industrial floor, a PhD subject has been published in 2018 with the goal to synthesize phosphorene on semiconductors or insulators. Candidate materials are silicon, silicon carbide and sapphire. Combining III-V materials, such as GaAs and silicon, is a promising way to fabricate tandem solar cells with an efficiency that would overcome the theoretical value of 29,43% (undoped crystalline Si). It was the purpose of a thesis defended in January 2018. In its manuscript, Gwenaëlle Hamon from LPICM presented an innovative approach to grow tandem solar cells by low temperature PECVD. First she studied the epitaxy of Si and SiGe compounds on Si substrates. She discovered that, with PECVD, SiGe solar cells have better efficiency when grown at 200°C instead of 175°C. Then she studied the heteroepitaxy of silicon on GaAs and successfully grew monocrystalline layers of 1µm. 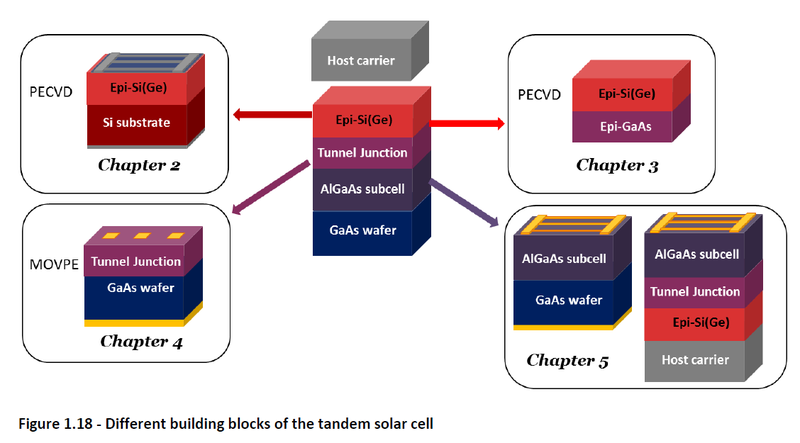 But there are still many challenges to overcome, for fabricating tandem solar cells. Indeed, the main issue is to separate the GaAs substrate from epitaxial layers. They also propose to use Si(Ge) on GaAs instead of Si, with a lattice parameter closer to GaAs. This solution is supposed to induce lower strain on the GaAs layer after removal. Gwenaëlle Hamon. III-V/Si tandem solar cells : an inverted metamorphic approach using low temperature PECVD of c-Si(Ge). Materials Science [cond-mat.mtrl-sci]. Université Paris-Saclay, 2018. English. <NNT : 2018SACLX004>. <tel-01713283>. French CNRS researchers (2) are working on alternative Thermoelectric (TE) oxide films deposited by solid-source oxide MBE. Selected materials are perovskite oxides, a versatile material class with an ABO3 or A2BO4 crystalline structure. Two types of perovskites have been tested : (La,Sr)TiO3 and (Ba,Sr)TiO3 epitaxial films. (LaxSr1-x)TiO3 is a good candidate material because its TE properties are reproducible and its resistivity appears to be very low (<5 10-4 Ohm.cm). 20 nm, (b) 250 nm, (c) 0.7 μm LSTO layers and (d) single-crystalline 1.4 at% (0.7 wt%) Nb-doped STO(001) substrate. They succeeded in growing LSTO epitaxial films with excellent structural quality, on SrTiO3(001) substrates, up to µm thickness range. Their results show that La-doped STO films can be grown by standard MBE techniques, for thermoelectric element fabrication. Source : Apreutesei et al. Thermoelectric La-doped SrTiO3 epitaxial layers with single-crystal quality: from nano to micrometers. There is no doubt that quantum physics is playing an important role in thin film elaboration and this role will increase in the upcoming years. Epitaxy is at the cutting edge of technology and the best is yet to come ! Meet up with Codex International, Partner of the event, on the occasion of the MRS 2019 Spring Meeting to be held on Avril 22-26 2019 in Phoenix, Arizona. Over the past ten years, paper has emerged as a focus area for researchers developing innovative techniques for printed basic electronics components. The goal of this research is to replace plastic substrates with low-cost, versatile and sustainable materials.